The oil is taken from all parts of the plant. Native to Australia, this plant has been known since the dawn of time by indigenous Australians. Today the oil has been scientifically proven to be resistant to bacteria, fungi and viruses at a rate five times better than normal household antiseptics. No medicine cabinet should be without this essential oil, as it is one of the most powerful immune system stimulants. It is a small tree from New South Wales in Australia, with needle-like leaves and heads of yellow or purplish flowers. Even when this tree is cut down, it flourishes and is ready for cutting again in two years. In World War II, the producers and the cutters were exempt from military service until enough essential oil had been accumulated. Each soldier and sailor was issued with some as part of his kit, to treat tropical infections and infected wounds. It's only recently that essential oil companies have begun touting tea tree's healing properties. Medical journal articles support reports of its ability to heal mouth infections. • For delicate individuals who struggle with feelings of victimization. Increases tolerance, physically and emotionally. • Anti-inflammatory, antiviral, antibacterial, antifungal; destroys parasitic infections, encourages the healing of wounds, clears lung and sinus congestion, stimulates immune system. • Tea tree revives the mind and the spirits. Builds confidence, patience and understanding. • Its primary use is in products for gum infection and canker sores, germicidal soaps, and deodorants. • Called a 'medicine cabinet in a bottle', tea tree oil is effective against bacteria, fungi, and viruses and stimulates the immune system. It is used in compresses, salves, massage oil, and washes to fight all sorts of infections, including herpes, shingles, chicken pox, candida, thrush, flu, cold, and those of the urinary tract. • Studies show that the presence of blood and pus from infection only increase tea tree's antiseptic powers. • It heals wounds, protects skin from radiation burns from cancer therapy, and encourages scar tissue to regenerate. • Tea tree also treats nappy rash, acne, wounds, and insect bites. Adding just one drop to dish and nappy washing rinses gets rid of bacteria. It may be used without dilution topically to treat bacteria, viruses and fungi, as well as to wash wounds, ulcers and burns. 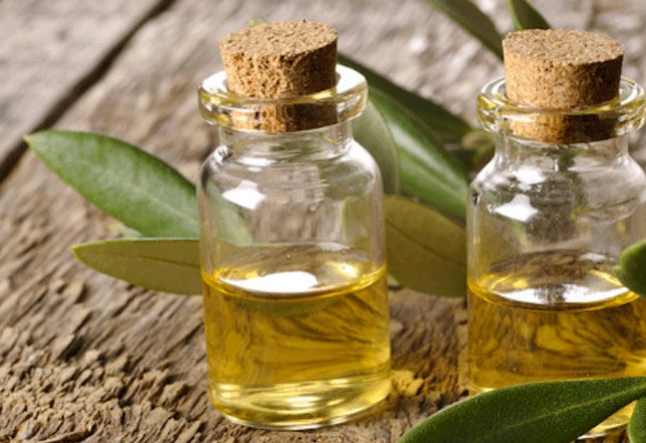 • Massage with tea tree oil before an operation to fortify the body and reduce post-operative shock. It also helps clear bronchial congestion, asthma, coughs, sinusitis, whooping cough and tuberculosis. • Tea tree can be used to help clear vaginal thrush, cystitis and genital infections in general. • On the skin, it clears abscesses, acne, burns, herpes, oily skin, athlete's foot, cold sores, blemishes, diaper rash, warts, sunburn and infected wounds, while fighting dandruff on the scalp. It helps purify the environment, prevent the spread of infection and bring the clear, clean smell of the Australian bush to your home. Possibly sensitizing to some individuals.